Bottom line: Corsair is providing an end-to-end solution of RGB hardware and software. An entire product line is available to satisfy all of your performance needs while offering more RGB than you ever thought you would need or want. New software, memory, and a case to build in all launched today. Corsair launched beta versions of its unified iCUE software a few months ago. Now at Computex 2018, Corsair has stripped iCUE of its beta status and is officially debuting the control and customization tool. Supported keyboards, mice, AIO liquid coolers, power supplies, fans, and other accessories can all be controlled through iCUE. Synchronization of lighting across an entire system is possible so long as supported hardware is installed. Enthusiasts seeking the most premium offerings and searching for every last piece of RGB hardware imaginable previously encountered one small caveat with Corsair. Dominator Platinum memory was unavailable with RGB lighting. Now, Vengeance RGB Pro Series DDR4 memory fills that void. 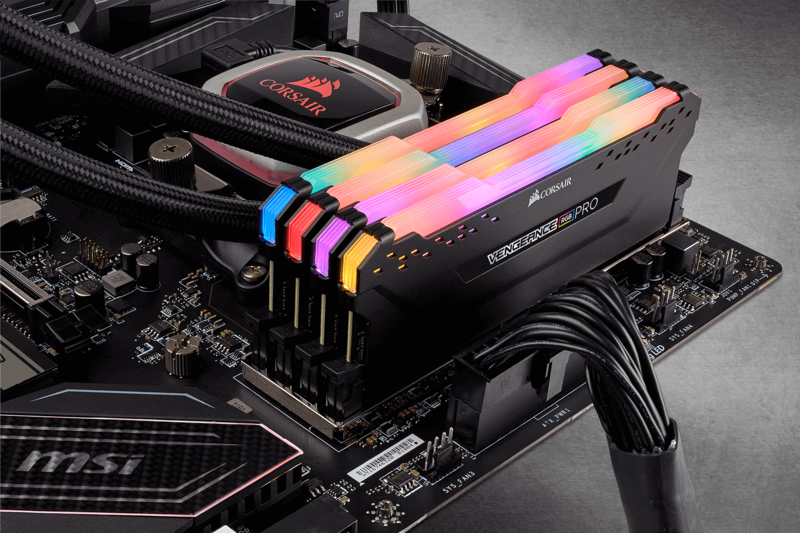 The latest memory from Corsair has multi-zone RGB lighting across the top of each module. Ten RGB LEDs are controllable with the help of iCUE. Not to overlook performance, Vengeance RGB Pro supports XMP 2.0 for easy overclocking and adjustment of settings, achieving speeds up to 4,600MHz. An aluminum heat spreader helps keep the colorful RAM cool. Should you already have Gigabyte's RGB Fusion or MSI's Mystic Light software, either can be used to control the lighting on Vengeance RGB Pro memory. This is a nice gesture by Corsair to prevent the need of unnecessary software for just one product. However, if you have multiple products that are supported by iCUE, you are going to want to use it. Finally in Corsair's announcements of the day, the Obsidian 500D RGB SE has been introduced. Smoky tempered glass and three LL120 RGB fans in the front set this apart from the standard Obsidian 500D. Features of the case remain nearly identical to the existing Obsidian 500D. Standard ATX, MATX, and Mini-ITX motherboards are supported. A 360mm radiator can fit up front while a 280mm radiator fits on top. Two 3.5-inch and three 2.5-inch drive bays can be found inside. Vengeance RGB Pro memory will be available in June 2018 in black or white. iCUE software is freely available for download immediately. The Obisidian 500D RGB SE is available now directly from Corsair with a suggested price of $249.99 and will be available from authorized distributors as soon as possible.